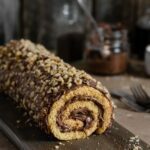 Orange Chocolate Swiss Roll Cake Recipe made with orange zest, cardamom, chocolate frosting, and topped with chopped walnuts. Preheat oven to 350˚F. Lightly spray with non-stick spray and line the bottom of an 10.5 x 15 in. Jelly Roll Pan with parchment paper. In a small bowl hand whisk together flour, salt, cardamom, and orange zest. Set aside. Place eggs in the bowl of a stand mixer fitted with whisk attachment and beat on high until foamy (1-2 min.). Then, gradually add the sugar and continue on high for about 7 min. The egg mixture should double in volume and be full of air bubbles, like a cloud. Remove bowl from stand and slowly begin to fold in the flour a third at a time, using a spatula. Stop mixing when you no longer see streaks of flour. Take melted butter and coat the top of the parchment paper. Scrape batter onto jelly roll pan. Take a small offset spatula and smooth into an even layer. Bake sponge on the lower rack for about 10 minutes until golden. It should spring back when gently pressed with finger tip. Remove from oven and gently run a thin knife around edges of cake to loosen from the pan. While cake is still hot, using oven mitts invert cake face down onto a clean, dry linen towel (you can also use parchment paper). Peel away the parchment paper from the sponge cake. Starting at the short side, roll the cake into the towel. Go slowly and try to evenly the tuck the sponge into a cylinder as you go. While cake is cooling make your chocolate cream filling. Combine cream cheese and chocolate frosting in bowl of stand mixer and whip until smooth. Carefully unroll the cake cake and gently pull off towel. Cake can still lay on the open towel as you assemble. Spread chocolate cream in a nice thick layer across the sponge. Roll the cake back into a cylinder carefully. (without towel). Place cake seem side down onto serving tray. Place in the fridge for about 30 minutes to chill. This helps set the cream and prevents extra crumbs from falling off while frosting. Remove cake from fridge and spread a generous layer of chocolate frosting into cake. Top with nuts or sprinkles!